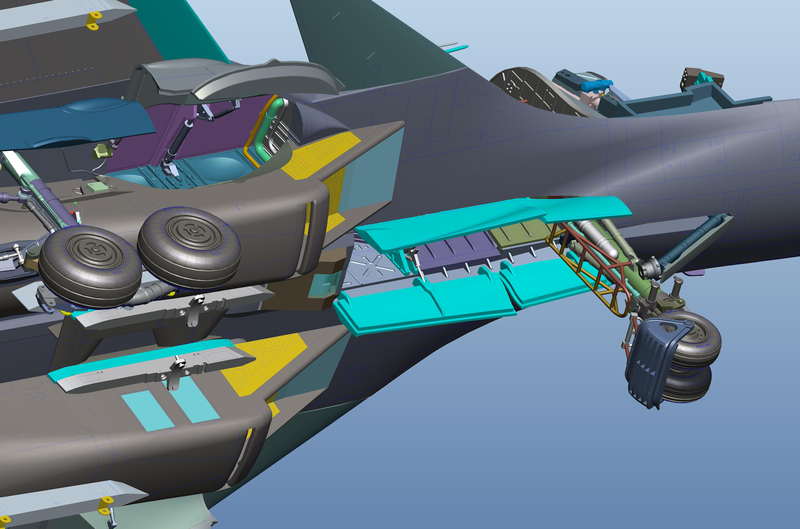 Kittyhawk has sent pictures of the continued development of their new 48th scale Sukhoi Su-34 "Fullback". This kit has been recently revised and upgraded, and as you may notice int he latest CAD drawings we have - it's looking like it is for the best. Some of the first run of the initial CAD designs of Kittyhawk's Fullback that have since been improved upon. Need to know more about the "Fullback" in real life? 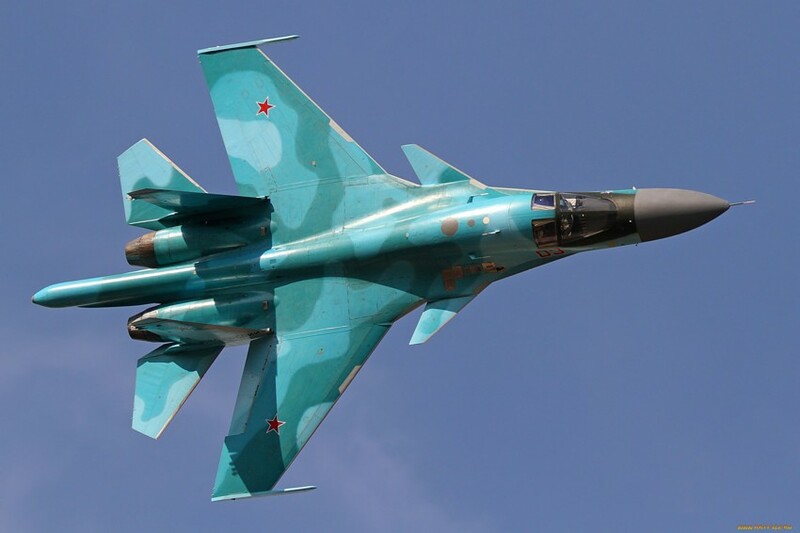 The Sukhoi Su-34 (NATO designation Fullback) was developed primarily for the strike/attack role to replace the Su-24 Fencer. 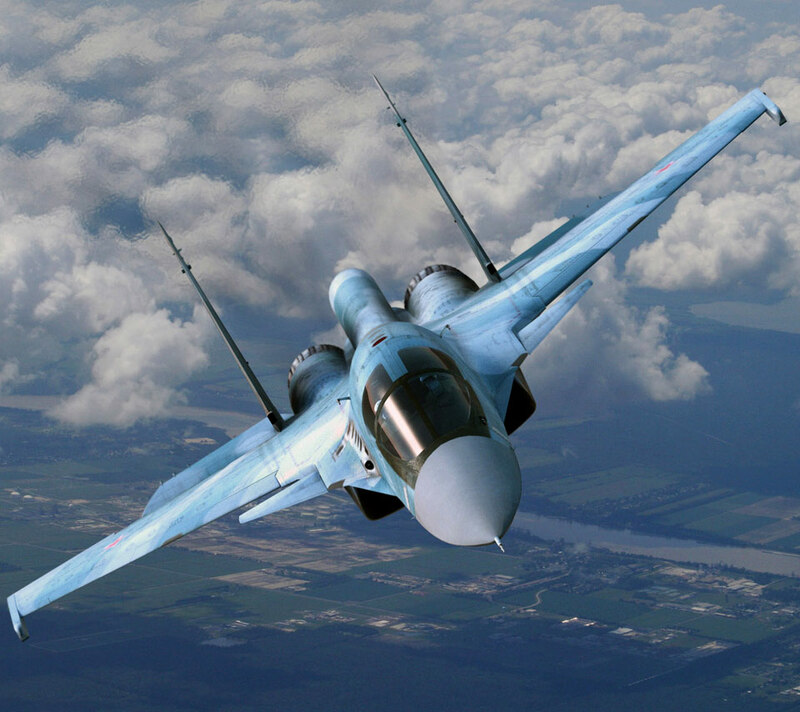 It is a derivative of the Su-27 Flanker, easily distinguished by its side-by-side cockpit and the 'platypus' nose. First flown in 1990, this aircraft was originally designated the Su-27IB. 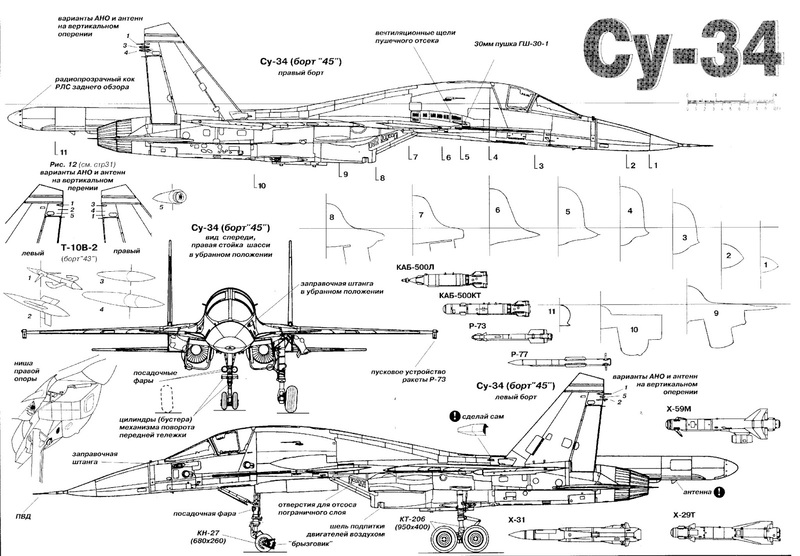 In 1995 a pre-production aircraft, designated as the Su-32, was revealed. Development was slow due to limited funding. Until 2004 a total of 8 pre-production aircraft were built for trials and evaluation. 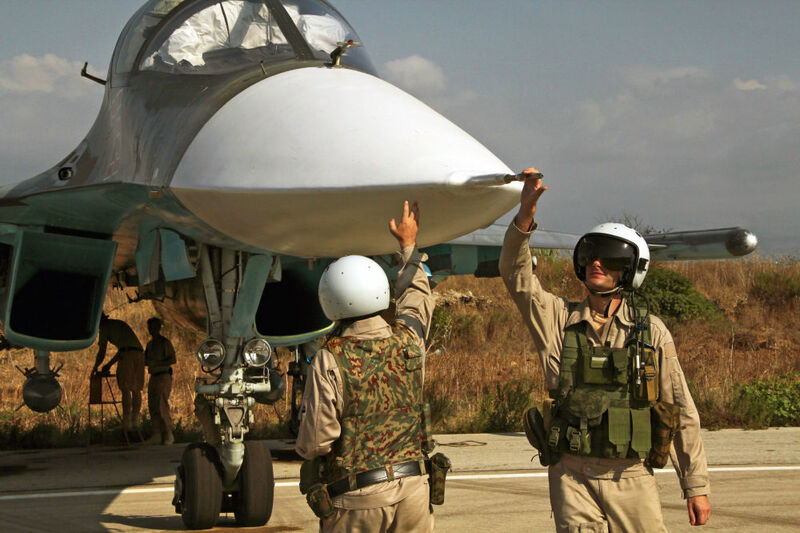 A couple of years ago Russian Air Force has adopted the Su-34 designation for this aircraft. 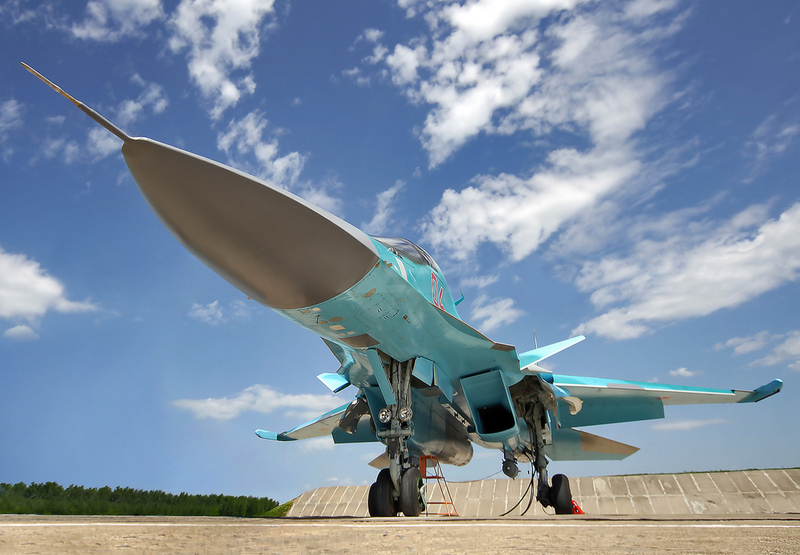 The Su-34 officially entered service with the Russian Air Force in 2014. 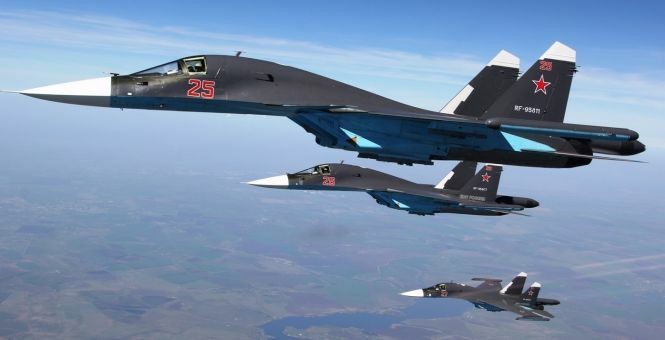 As of 2015 Russian Air Force operates 76 of these attack aircraft. It was stated that total Russia's requirement is for 200 interdictors of the new type. 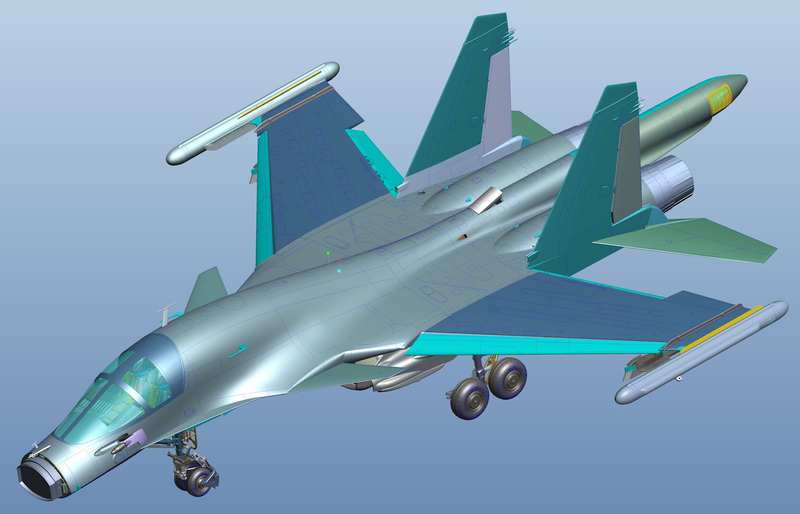 The Su-34 is also proposed for export customers, however, it has received no orders to date. Upgrade programmes continue for surviving Russian Su-24s to extend their service lives. 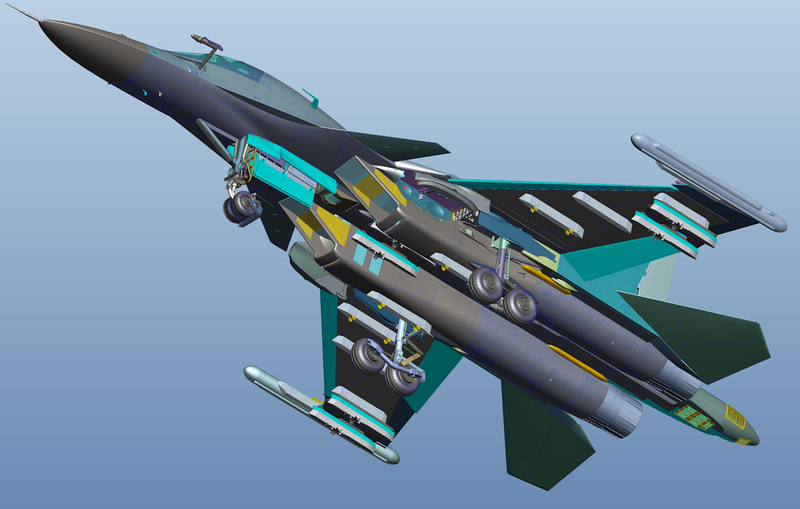 The Su-34 Fullback design retains the Su-27s basic layout, construction of the airframe, engines, most of its wing structure, tail and a substantial part of the onboard equipment. It also uses canards of the Su-30 for improved manoeuvrability. Aircraft has entirely new nose and forward fuselage with the cockpit. The advantage of a side-by-side cockpit is that duplicate instruments are not required for each pilot. It is also more comfortable on longer missions. The Su-34 has a modern glass cockpit, with colour multi-function displays. The nose section of the Fullback accommodates advanced multi-mode phased array radar, capable of terrain following. Cockpit and some other crucial components and systems are armoured. Aircraft is fitted with comprehensive electronic countermeasures equipment. This interdictor is armed with a 30-mm GSh-301 cannon with 180 rounds. Aircraft has 10 underwing and under-fuselage hardpoints for a wide range of weapons, including air-to-air, air-to-surface, anti-ship and anti-radiation missiles, guided or free fall bombs. 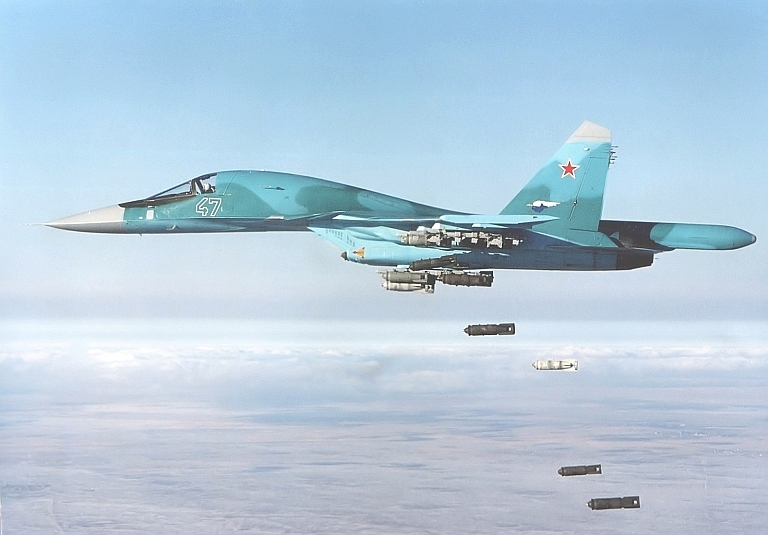 The Su-34 normally carries 4 000 kg of weapons, however, maximum capacity is 8 000 kg. The primary air-to-air weapon is the R-77 (AA-12) missile. Two R-73 (AA-11 Archer) short-range air-to-air missiles are typically carried on wingtip rails. 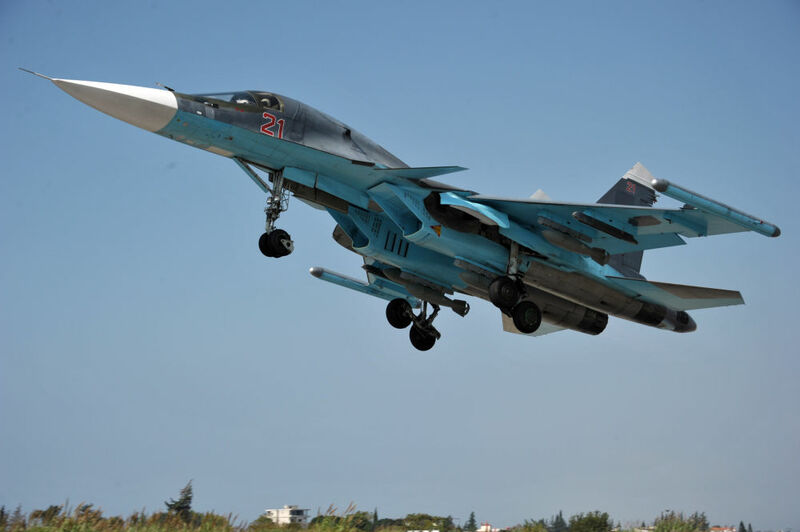 The Su-34 has a rearward facing radar and can launch air-to-air missiles at pursuing enemy aircraft. For strike roles emphasis is placed on long-range standoff weapons, such as Kh-55 (AS-15 Kent), Kh-59 (AS-13 Kingbolt) cruise missiles, Kh-25 (AS-10 Kerry), Kh-29 (AS-14 Kedge) air-to-surface missiles, Kh-31 (AS-17 Krypton), Kh-35 (AS-20 Kayak), Kh-41 Moskit, and P-800 Oniks anti-ship missiles, and Kh-58 (AS-11 Kilter) anti-radiation missiles. Guided bombs include the KAB-500 and KAB-1500. Aircraft can also carry electronic warfare or reconnaissance pods. 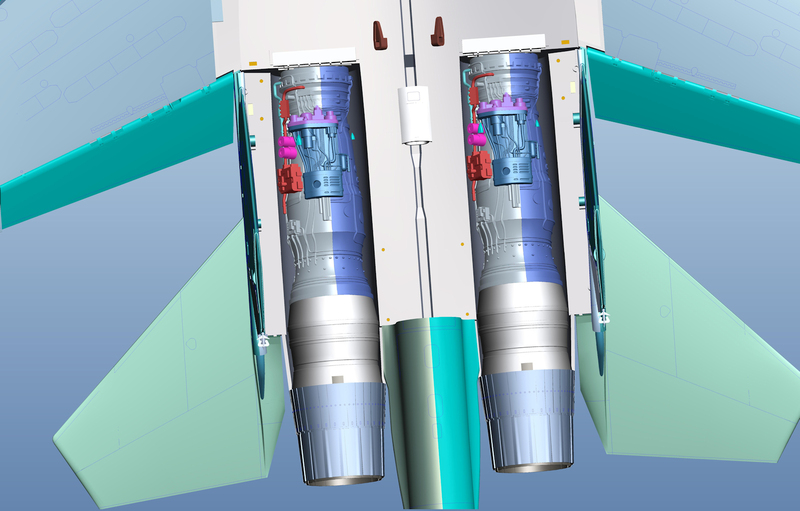 The capacity of internal fuel has been increased and three external fuel tanks can be carried. Aircraft also has in-flight refuelling capability, that allows missions of up to 10 hours duration. 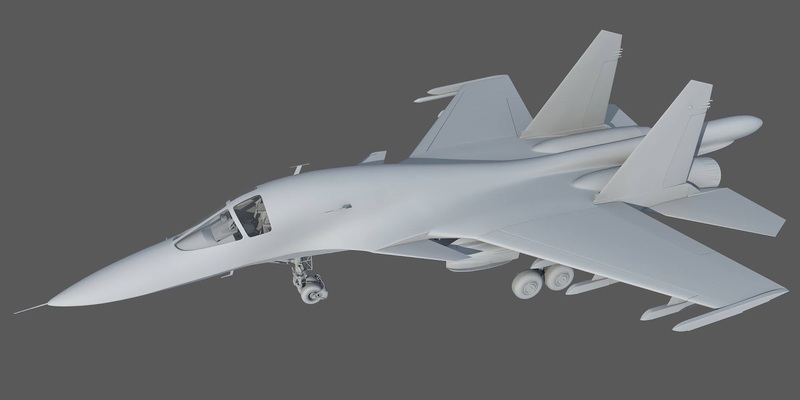 This aircraft is also being proposed for the Russian Air Force to serve in the heavy interceptor, reconnaissance, electronic warfare and defence suppression roles. 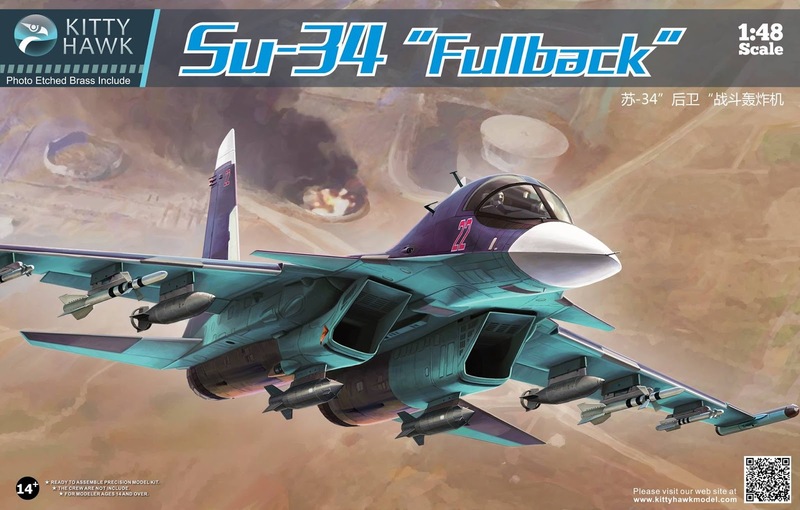 Kittyhawk's model of the Sukhoi su-34 Fullback in 48th has seen three major incarnations that we have seen. The kit has been revised and polished in its design and construction steps to make it an easier, more detailed and a more practical kit to make. 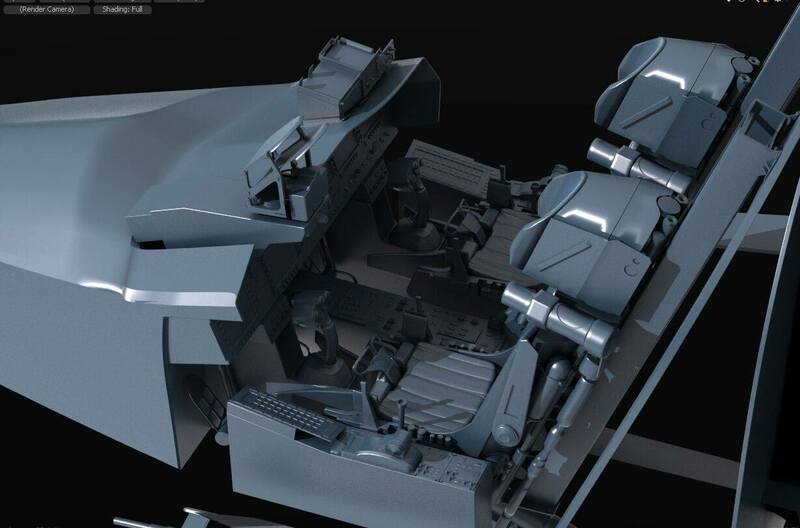 The pilot's capsule has been upgraded with more detail, the photo-etch parts that make up the thinnest of details are in the right place and twin K-36DM zero/zero ejection seats look pretty impressive as does the wheel bay arrangement and the single cannon on the starboard side of the wing root extension. The wings and control surfaces have been refined to more accurately reflect the original aircraft. 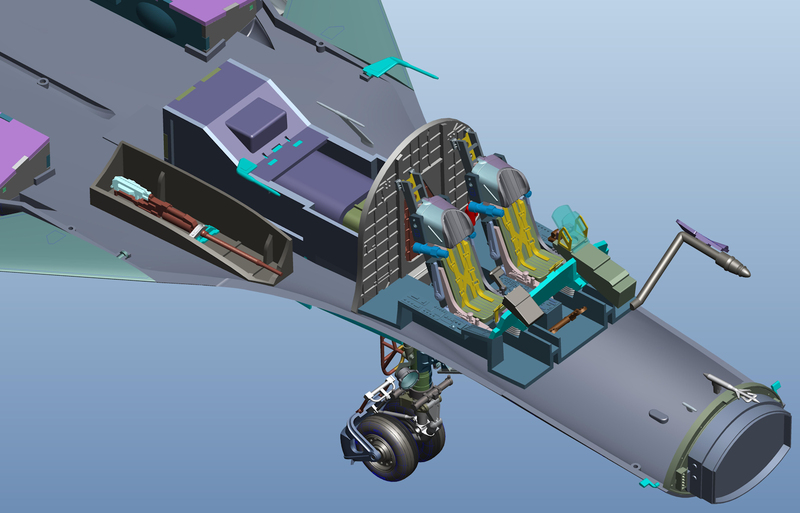 Engines have been reproduced in their totality to show a detailed dio of a working Sukhoi undergoing engine repairs or refit. You can see how much detail has gone into the research of this kit by the underside preview of the CAD work. The piping in the undercarriage bays, the detail on the wheels and the pylons looks impressive to us!